WSOP REAL MONEY POKER NEVADA- THE ULTIMATE POKER! We all know what Classic Poker was like. The location was generally a casino where a dealer used to deal all the cards and 5 to 6 players were attending the Round-Table-Conference. But the people who could afford such expensive casinos visited there and bet for more than a thousand dollars. However, the arrival of the Internet had done the same thing to these games and everyone can enjoy it by sitting anywhere at anytime. The world of mobile gaming came to prominence since Apple launched the iTunes Store. The store which is a home to millions of apps has more and more being added day by day. There are a lot of online casinos which offers various games that can be played for real money or just for fun. One of them is WSOP Real Money Poker Nevada. WSOP Nevada is a real-money online Poker from the World Series of Poker brand. The site is developed and maintained by Caesars Interactive Environment, and it operates within the Nevada State only. The app is compatible with iPad having iOS 5.1.1 or any later version of the Operating System. The WSOP is the premier live poker tournament series in the world. It takes place every summer from late May through early July at the Rio All-Suite Hotel and Casino in Las Vegas. The WSOP was first launched on September 17, 2013 and it was the second online poker room in Nevada. WSOP offers a lot of cash games and tournaments which can be played by the people who’re physically located within Nevada, a state of the U.S. There are more than three dozen daily poker tournaments also at WSOP.com. However, the visitors who don’t live in the State are able to participate as well with proof of age. 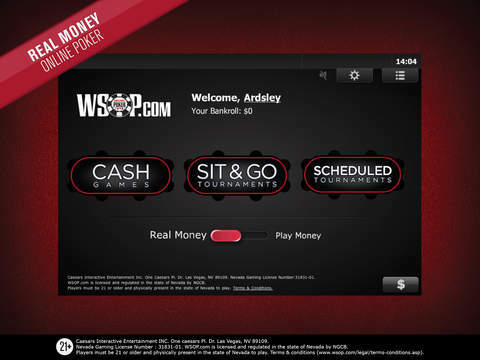 If you’re a current player of the WSOP, you can Login using existing credentials and new players can create their account on the WSOP.com through its mobile client. With WSOP, the promotional opportunities and traffic on the site in Nevada is also increasing. In addition to reload bonuses and related promotions, players also have a multitude of ways to win seats into various events. You can get 100% to $1000 bonus when you deposit money for the very first time. WSOP subscribes to Responsible Gaming as a part of our code to Commitment to the players. Your privacy and security is protected by the industry’s highest encryption protocols and SSL technology. The games are fully licensed and regulated, and are audited and compliant with all regulations as mandated by the Nevada Gaming Commission (NGC). There are some minor bug fixes in this new version of the WSOP. 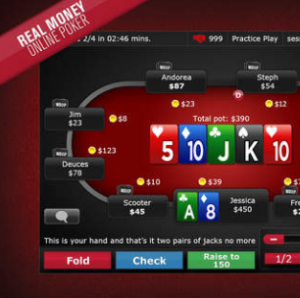 Get the app now and start playing Poker! The app is available for free in the iTunes Store. 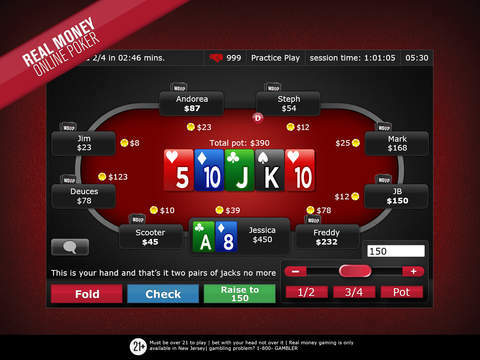 Pros: a variety of cash games and tournaments; reliable app; SSL protection; bonus and cash prizes available; safe and secure; smooth graphics; free. Cons: can be played only in Nevada.